The 1991 Ford Mustang we looked at yesterday may not have been one of the extremely rare Ferguson Ltd. 4WD ‘Stangs of yore, but it sure looked like it wanted to get in on their party. With a raised body, big flares, and even bigger tires beneath, that Baja freshened beast also looked like a lot of fun. And, at just $5,500, it appeared to a bargain too, at least for the 73 percent of you who enthusiastically pushed it over the top in a Nice Price win. One notable aspect if all of the cars we’ve featured so far this week has been the presence of a manual transmission. Sometimes those sticks have stuck up in less than expected places. Other times, where you’d want one most. We’re continuing that streak today with a car that, when new came with either a six-speed stick (yay!) or a somewhat dowdy CVT automatic (embarrassed sympathy clap). This one of course garners the cheers for its stick. Nissan’s Juke always was and will always be a weird looking car. That’s not to say it’s Elephant Man fugly. No, it’s more... shall we say, eclectic. Perhaps it’s a styling take that demands familiarity in order to gain acceptance. Well, if you’re going to get to know a Juke then you’re best bet is to do so with a Nismo edition. That’s because the Nismo give’s you more of the sort of stuff you really want. That’s stuff like horsepower, handling, and a steering wheel that has a red stripe to let you know when you’re going straight ahead. This is innovative, life-altering stuff here, people. A couple of years after the shock of its styling had worn off, Nissan decided to give the Juke some balls. This was perhaps to allow owners a quicker escape from awkward questions regarding the looks. The Nismo and later Nismo RS added both more ponies and a tighter suspension to help keep theat bigger corral from getting out of hand. In the standard Nismo that means 197 horses from the turbocharged 1.6-litre mill, a jump of 9 over the non-Nismo turbo. The DIG-T four sits transversely under the hood and in this car’s case powers the front wheels through a six-speed manual. An Xtronic CVT was also available but is no where near as engaging despite its sci-fi name. With less than a ton and a half to fling around, the Nismo’s engine and manual gearbox make for a winning combination. In my experience, the drive train, along with the Juke’s somewhat tall dimensions, make it go like a very quick bar stool. You could belly up to this Brilliant Silver over black cloth ‘14 Juke with that intent since it’s one of the rare manual editions to be present on the market. The car is described in its ad as being in “perfect condition” and carries both a clean title and a modest 50K on the clock. The bodywork looks clean and without flaw. 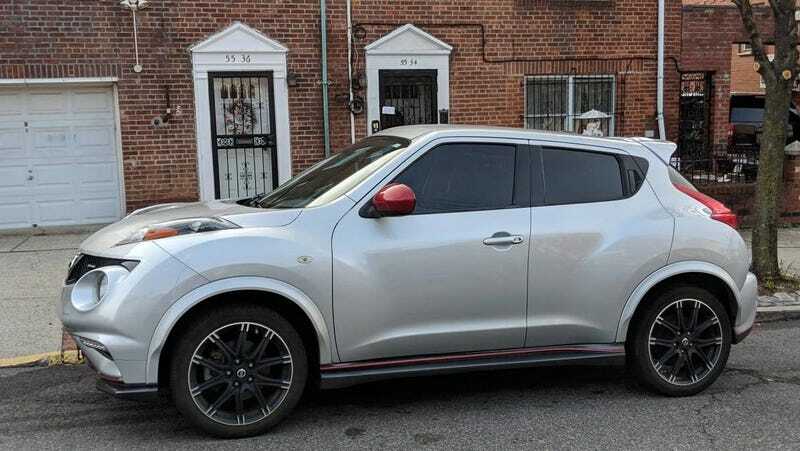 That requires some close examination since the Juke’s styling is rather convoluted, and from some angles you have to wonder if a particular crease or lump is intended or accidental. The interior is likewise in ready, steady, go condition and features the aforementioned red striped steering wheel as well as cosseting front bucket seats. The motorcycle-themed space features red stitching on all of the upholstery, and a head unit with satellite and nav. Outside, 18-inch factory alloys underpin and are wrapped in low profile meats. What’s not to like here? Well, as mentioned you could take issue with the styling. That’s a take it or toss it proposition right there. You could also claim that the Nismo isn’t enough of a good thing and are waiting on the even more brawny RS edition. Yeah, that would be nice but those are even more rare than the standard Nismo with a swizzle stick. The last item that may give you pause is the price. 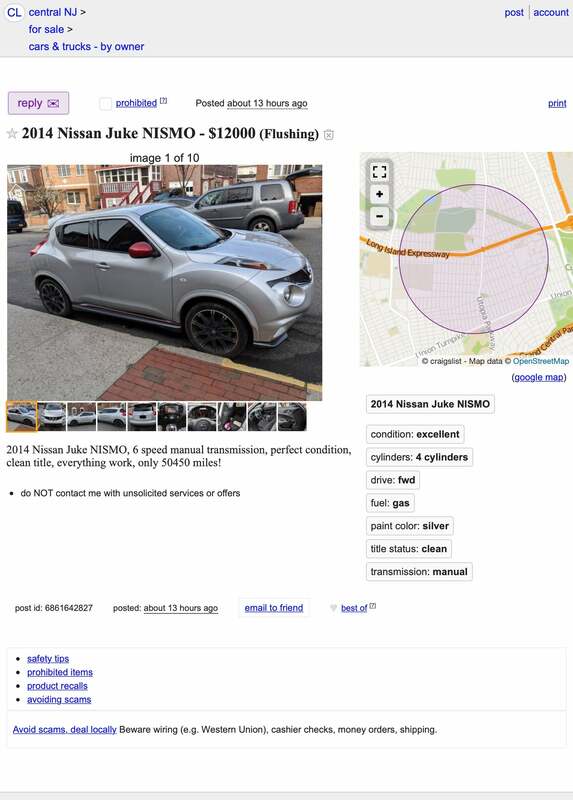 The asking on this Juke is $12,000. That gets you a good pony count, some red accents, and maybe some not so good looks. What’s your take on all that and the asking? Does $12,000 feel like a fair price for the car as it’s presented? Or, does that price have you dancing away? At $27,995, Could This 2013 Nissan 370Z Nismo Have You Rebel Yelling Mo, Mo, Mo?